left to right: Waldo County Technical Center students Daccariah Sargent, Israel Beaullieu, and Hattie Gibbs tour Belfast’s Transfer and Recycling Facility with transfer station manager, Sandy Carey. 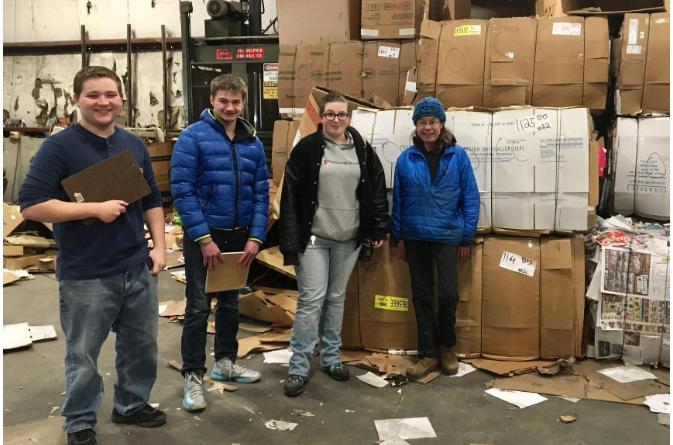 BELFAST — Students in the Outdoor Leadership program at Waldo County Technical Center (WCTC) visited Belfast’s Transfer and Recycling Facility on Feb. 27 as part of their ongoing recycling initiative at the school. The teens have saved 700 pounds of recycled paper and cardboard from the Tech Center from going into the landfill since starting the project in October. During the trip to the transfer station, manager Sandy Carey gave the WCTC students a tour of the facility and explained how Belfast’s recycling system works. The students were able to see the recycling process of the material that has been gleaned from WCTC. Outdoor Leadership students will be sharing this project in a statewide community service competition through the Career and Technical Education (CTE) competition, SkillsUSA, on Friday, March 8 in Bangor. With the support of their instructor Nicole Caruso and math instructor, Lacey Breems, they will showcase their recycling initiative and explain their goals and objectives. Students project that by the end of the initiative’s first year, they will have recycled at least half a ton of material. All information is being documented and analyzed in an online spreadsheet and logbook. This project exemplifies how Waldo County Technical Center combines student interest and academic skill with real world experiences and career and technical training.